Fabio Salvadori | Page 11 of 12 | Coach. Author. Seeker. To empower means to give (someone) the authority or power to do something. Or, more broadly, to make (someone) stronger and more confident, especially in controlling their life and claiming their rights. Being able to empower others is often listed among the pillars of an effective leader. When we empower someone we are giving the same power we have. An empowered person gains control over her work or life. In organisations, empowering everyone is a crucial ingredient to create a democratic and flat organisation. One in which, everyone raises to the same level creating co-leadership. Though, there is a fascinating paradox in empowerment. When we, as leaders, are empowering others, somehow we are elevating ourselves one layer above them. They may have now the power to do something, but we are the ones who gave them the power. So, we are still above them, and they have less power than we have. Isn’t that through the empowerment of others we are in reality reinforcing our own power? What would change if instead of empowering others we create the space in which they can awaken their inner power by themselves? Have you ever heard of a product called VantaBlack? It’s a paint developed in the United Kingdom, and it is one of the darkest substances known. It can absorb up to 99.6% of the light. If you search for it on youtube, you’ll find a video in which the creators show a mask painted with this material. If you look at the object from the front, you just see a flat black surface, like a hole in the space. The mask has no shape, no depth, no form. Only when the camera moves to the side, you can see that the object is not flat. This is because our eyes use lights and shadows to understand the shape of things. That video reminds me of the importance of having different perspectives. Sometimes, we get stuck into one view, and we become blind to the richness of what we are looking at. To be able to perceive their depth and their substance, we need to embrace different perspectives. We can shift the lights or move to a new point of view. Only seeking multiple perspectives, we can see the wholeness in everything and everyone. You probably read this quote in many books and articles. If you ever rode a motorbike, you undoubtedly experienced how the bike follows your gaze. If you look at the obstacle, you will hit it. If you watch a professional motorsport race, you will notice how the riders and drivers are always looking where they want to go and not where they are going. So, where are you putting your attention? More and more I see on social media people complaining against obscure big enemies or crying about big humanity problems about which there is nothing they can do. As a result, their energy goes consumed by rage or wasted in words without actions. What would happen if every person put all the attention in something maybe smaller but doable? That energy would create an impact, albeit small, that will make a difference. And you know, even the biggest ocean is made of drops of water. I picked a BeTheChange card this morning. One that says “Being Creative by BEING who you are”. This card is an invitation to explore my bigger me. It challenges me to think about when I’m most of who I am. I started writing about the quest for who we are. I wrote and rewrote each sentence. Until I realised that I wasn’t me. Sometimes, the search for something can take us away for that same thing that we are looking for. In my desire to find the real me I was walking away from it. My bigger who is not in the answer. It lives and expresses itself in the question. A few weeks ago, I was in the same room with my mother and my grandmother. Unfortunately, both widows. I joked around the fact that in my family there are a few widows but no widowers. It looks like women in my family are better equipped for the senior years. And being a male this is not a promising statistic. Out of curiosity, I checked the national statistics to understand if this is a phenomenon circumscribed to my family. Apparently, It is not. In Italy, the number of widows aged between 55 and 75 is almost five times bigger than the number of widowers. Women live longer. That’s a fact. I’m not an expert on the topic, and I’m sure Google is full of researches and studies providing reasonable explanations. However, on the flight back home I didn’t have an internet connection, but I had a lot of time to think. I reviewed the lives of the widows in my family, and I noticed a recurring pattern. In the course of their lives, they all had to change often. Take my mum, a woman born in the mid-fifties. When she got married to my father, she was working in a factory. Then she had me, so she started working from home while taking care of her son. Later my sister arrived, we moved to a new house, she became a full-time housewife, she supported us through different schools, a third child came and so on. While we were growing, she had to keep growing with us. In the space of one life, she had to continuously change and adapt to the evolving circumstances of our family. While she was going through all these changes, my father had been doing the same job day in and day out. Yes, he had to go through the same events, but his life didn’t change much when we arrived or when we move to a new house. He just kept going on with the same work, the same hobbies. Sure, being an entrepreneur, his work was more fickle than many others. Still, he didn’t have to adapt to the changing circumstances as much as my mum had to. All the women in my family had to learn early in their life to be flexible, to adapt to the circumstances and to not be scared by changes. At the same time, their men were bastions of stability. They didn’t have to change much. Then, their body got older, and they couldn’t do what they used to do anymore. Or they retired. Whatever the reason, at one point they had to change. And often, while going through that change, they passed away. I don’t want to come through as judgemental. These men were remarkable husbands and fathers. The grew up in villages that were recovering from an awful tragedy like the Second World War. Everything these men longed for was to create stability for their families. On top of that, a lot of them went from being farmers to become factory workers. Instead of dealing with the changeability of nature, they had to fit into the routine of a tedious job. While their wives were continually changing and adapting, they were trapped in that same stability they had built. And when circumstances changed too much, they weren’t ready to adapt. Even worst, they were probably too tired to try. According to biologists, large parts of our body cells are replaced by new ones every few days. Our red blood cells are completely replaced every four months. Some say that our all body is renewed every seven years. If there is a constant in nature, that is change. We are designed to relentlessly transform. So, to stay the same, we must exert a force against the natural flow of life. A life spent resisting changes creates a constant subtle tension. One that we may not notice on an average day but that, on the long distance, will take a toll on us. When inevitable changes come our way, we have no energy left neither to resist nor to adapt. Just to make things clear, I have no data to back up my theories and no evidence except for personal experience. But, observing this pattern in my family made me think. It also gave me a new perspective to look at some events in my life. I grew up fearing changes and new things. For the first three decades of my life, I have avoided new experiences as much as I could. I kept eating the same stuff, listening to the same music, going out with the same people. I was boringly predictable. And you know what? Family and friends loved me for that. I was a fixed point in their lives. At least this is what I thought at that time. My ex-wife loved that side of me too. I was undoubtedly an immutable partner. Too much with hindsight. During our years together, while she kept growing and changing, I kept being the same twenty-year-old-guy she had fallen in love with. Those different approaches to life created a growing distance between us. When that distance became unbearable, a significant change was necessary. Unfortunately, I was stuck in my stability. I didn’t have the energy to change or to resist, and we fell apart. It was painful. And liberating. With nothing left to hold together, I found the strength to surrender to change and embrace the transformation. In the years after, with the help of beautiful friends and masters, I found new stability within constant changes. One that is helping me live in harmony with the universe and the people I love. In closing, I can’t prove my theory with sound statistics. Though, I believe that being able to transform and change is vital and can make us live longer and better. So, I don’t know about you, but I’ll keep changing often. Discipline has played a crucial part in my childhood education. I’m talking about the kind of discipline that relies on punishment and guilt to educate people to follow the rules and codes of behaviour. Indeed, it was driven by love, but still, that was the idea of upbringing when I was a kid, in the seventies and eighties. Nonetheless, I was a rebel and a dreamer. I have always sought freedom, since when I was a youngster wandering in the woods fighting my imaginary dragons. I was a rebel inside, and a rule-abiding kid on the outside. No surprises that growing up I’ve always perceived discipline as a cage. I wanted to follow my intuition, to be creative without limits. How was it possible if I had to respect rules and form? Like when I aspired to become a rockstar. I wanted to be a songwriter, to write my songs and perform my guitar on a stage. I couldn’t understand why I had to repeat the same boring exercises day after day. Deluded, I gave up. I was looking for freedom, not discipline. So, I repeated the same pattern on any other project that required discipline. It didn’t help that the ones who loved me kept telling me how smart and creative I was. It just fed my ego and my belief that I didn’t need discipline. My talents were the unique source of my achievements. The first breakthrough came when I attended a riding class on a closed circuit. As I wrote previously, a circuit is by definition a closed loop. During the day of the course, I repeated the same sequence of turns and movements for hours, lap after lap. At every lap, my moves became a little more smooth, and my overall speed improved. In the last hour, I had the opportunity to do some free practice without the instructors. It was exhilarating. I instinctively knew where to put the wheels, where to brake and accelerate. I was free to play with the motorbike. I was so excited about the whole process that I forgot about my assumptions on discipline. To my surprise, I had been able to stay disciplined a full day, and at the end, I felt freer than when I started. That day, I felt that there was something wrong about my beliefs on freedom and discipline. I wasn’t entirely aware of it, but I started digging. I learned about underlying automatic commitments and limiting beliefs, but it was only when I met the Japanese word “Shuhari” that I had my second breakthrough. It is fascinating how the Japanese language can embody a whole concept into one word. The word Shuhari represents the three stages of learning to mastery in martial arts. 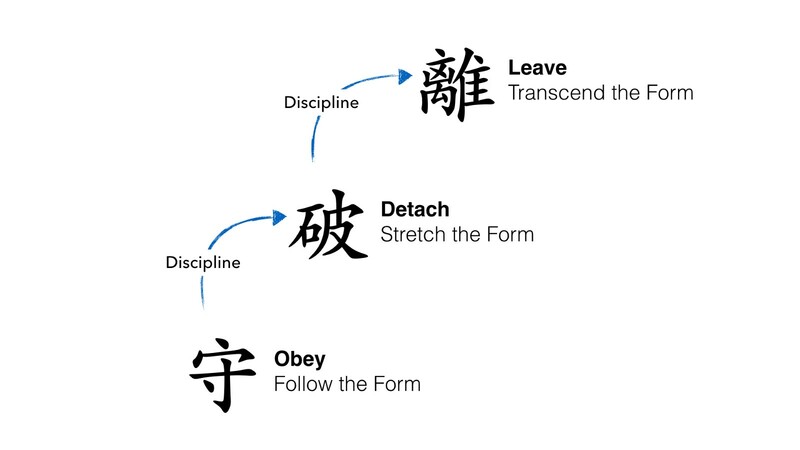 Shu (守) “obey”; It is the first stage, in which the learning is focused on the fundamentals. As students, we practice the techniques, the forms and the rules. We mainly learn from a single model through imitation and repetition until we can execute the form flawlessly. The focus is all on the what and the how. Ha (破) “detach”; The second stage is about expanding the learning, both in depth and width. We explore the “why” beyond the “how”. We learn the theories and the principles behind the techniques and the forms that we can now execute flawlessly. We also look for other models and integrate all these new learnings into our practice. Ri (離) “leave”; The higher stage is when the students become masters. Everything becomes natural to us, and we transcend rules and forms to create our own way. I’m not a martial arts practitioner, and my knowledge about Japan comes only from movies and books. But this concept immediately resonated with me. “Ri”, the higher stage, is my idea of freedom. Freedom is not the denial of the form. It is the transcendence of it. And discipline is a vital ingredient that sustains the journey through the stages. Thanks to the Shuhari concept I gave meaning to discipline. It wasn’t any more a limit to my freedom, but rather the way to achieve it. But then new and relevant questions rose to my mind. How do we know when we are ready to move to the next level? How do we avoid the risk to get stuck at the first level becoming perfect machines? How can we be sure that what we achieve at the end is freedom and not just the illusion of freedom? I needed another piece to complete the puzzle, and I found it in the conscious competence learning model. Unconscious incompetence: at this stage, we don’t know how to do something, and we don’t recognise the deficit. Only when we accept our incompetence, we can move to the next stage. Conscious incompetence: at this stage, we recognise our deficit, and we start the learning process to address that gap. Rules, forms and imitation are essential to building the competence we need (the Shu stage). Conscious competence: at this stage, we have finally acquired the skills we wanted but to use them we must concentrate. Conscious is highly involved in using the newly acquired skills. Being conscious of our skills allows us to go deeper in the understanding and explore the principles (the Ha stage). 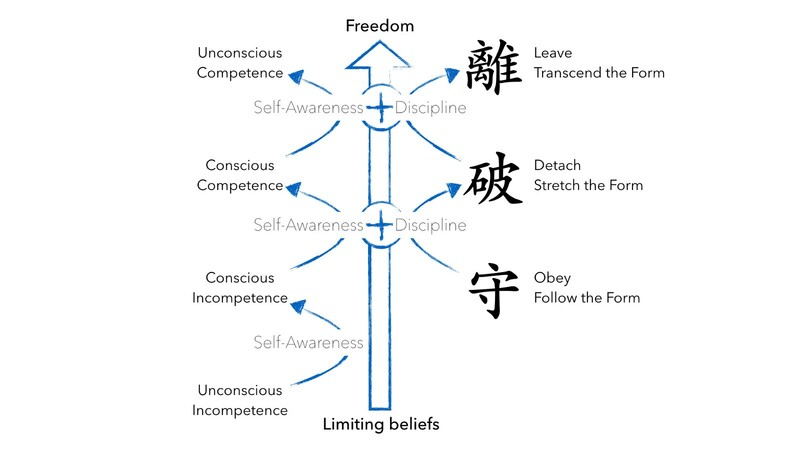 Unconscious competence: at the final stage what we have learned become “second nature”, and we can operate using the new skills without consciously thinking. We finally reach the Ri stage. Freedom. Self-awareness was the element I needed to complete my formula. Without self-awareness, the learning process won’t even start. The first necessary step to grow is to become conscious that we need and want to grow. It may look obvious, but it is not. Becoming stuck in our beliefs is easy. When faced with our incompetence it’s easy to accept it as a “limit” and make it our reality. And because we can’t go against reality we ignore our inability, or we find good rational explanations on why we don’t need to learn. That is precisely what I did with my belief about discipline. Self-awareness is also a fundamental piece of the whole learning journey. Without self-awareness, we won’t be able to understand when we are ready to step to a higher level. We won’t be able to go beyond the form, connect with the meaning and transcend it. Self-awareness magnifies our discipline and allows us to achieve the freedom we aim for. So, here it is, my not so secret formula to create freedom. Is it healthy and mighty? If it is, I’m very happy for you. Mine has always been weak. I was the kind of kid whose parents are told by teachers that “he is smart, but he doesn’t work hard enough”. I still remember the guilt for not having enough will to do more, to do better. Add to this that my father was a strong-will man. When he wanted something, he always made it happen. I was not like him. First of all, because I never knew what I wanted with enough clarity. And second, because even when I thought I knew what I wanted, I lacked the willpower to do the work to get it. I was lazy, and I felt weak and wrong. Though, results were telling a different story. Growing up, my results at school were above average, sometimes even excellent. As soon as I graduated, I found a good job that started a successful career by all measures. I’m delighted with the life I had. Delighted but not as much proud. Because of my lack of willpower, I always thought I was lucky to be in the right place at the right time. It wasn’t my doing. I was just a lazy lucky guy. A few weeks ago I decided it was time to dig deep into this with my coach. We took a look back at all my previous successes. Analysing the reasons that made me succeed I realised that there were always some external elements determining my results; a supporting team or partner, the right location, an accountability structure and so on. So, apparently, I was right; I was not the master behind my achievements. I have to thank the circumstances. That was indeed an AHA moment. I choose to work in that company, with that team. I decided to move to that place. I created that space in my house. I developed that accountability structure. It was my doing. So maybe I did more than I thought. Here’s what I’ve learned from this inquiry into my lack of willpower. I know people who push through things to get what they want. Their commitment, resilience and grit are admirable. No matter the obstacles they find on their path, they keep pushing. And the more they push, the more they are energised and motivated. It is as if their willpower is fueled by the resistance they encounter. My father was one of them. My willpower runs out as soon as I start whatever I want. So, when I try to push myself into doing something, most of the time I fail. And, believe me, I can be very good at finding excuses and procrastinate. In the past, I used to push myself even when the results were not coming. I thought it was the only way to do something and own the achievement. But that attitude led only to failure, shame and guilt. No, pushing doesn’t fuel my willpower. I am a pull type of person. You can try to push the water towards something, but most likely it won’t work. In particular, if the direction is upward. Instead, if you create an empty space before the water, it will flow into it, naturally. I need to be in an environment that pulls me in the direction of what I want to achieve. I need to be pulled into the results. Like water. To make it very simple, you can think of your environment as the sum of everything existing outside of your head. The physical space in which you live and work, the people and relationships, the tools you use, the clothes you wear, the car you drive, the routines you have, everything outside your mind contributes to your environment. If you also are a pull type of person, the first step is to accept that the environment is more powerful than your willpower. Like water, you will always adapt to the situations you are living and working in. The key is to transform this apparent weakness in strength. If your environment controls you, then use your willpower only to steer the environment in your favour. Then you can save your willpower for other tasks and let the environment pull you towards your goals. I know, the amount of things you can control or influence in your life, is limited. But the good news is that most of the time, you don’t have to do much. Just some little tweaks to turn your environment in your favour. Last week I experienced the power of a small change in my environment. Lately, I found myself wasting too much time on youtube. It’s like an addiction, a single video to relax my mind easily slip into a series of meaningless videos that eat big chunks of my time and undermine my focus. The problem is that the computer is my primary working tool. I cannot just stay away from youtube. The solution was simpler than I thought. One day I went to work in my usual café, and when I got there, I realised that I had forgotten my earplugs. Without them, I couldn’t watch any video in a public space without disturbing all the clients. So, no youtube that day and I ended up writing for three hours without distractions. If you are a pull type of person, you should learn to master your environment. And the great thing about shaping the environment is that you need to do it only once. At the very beginning, when your willpower is still strong enough. And then let the environment you just shaped pull you towards your goal. If you are struggling to push through the things you want to do, you may be a pull type of person. So, stop pushing so hard for a moment and check your environment. Are the people around you supporting your goal? Is your space helping you to focus or is it a source of distractions? Do you have an accountability partner or structure? The key to a better you may be just around you. This is not the end, this is just the beginning. As the people close to me know very well, I am not very good at celebrating my achievements. I’ve always been like that. When I arrive somewhere, my mind immediately starts to think about the next destination. The moment I have completed something, I am already projecting myself towards what comes next. Not a big issue, I know. But it’s annoying. In particular, because rewards are effective ways to motivate ourselves to achieve a goal. Because I don’t find rewards and celebrations particularly attractive, I can’t play this card to drive me to take action. Luckily for me, my coaches helped me in exploring this topic, understanding what drives me and defining alternative ways to pull myself into action. As Thoreau beautifully says in the opening quote, my growth and transformation are my sources of motivation. Though, this feeling of missing out is still present. The story of this post is an excellent example of my complicated relationship with celebrations. On the 31st of July, I completed my Coach Training and I got my Certification from ICA. It’s the result of thirteen months of study, work and sacrifices. I thought the occasion deserved a celebration and a post of its own. 9 days later, I couldn’t remember how many times I had written, deleted and rewritten it. I couldn’t understand what I really wanted to share. The why behind these words. Do I want to celebrate the achievement? Do I want to let the world know what I’ve been doing for the past year? Is it just a way to rub my ego? Is it a way to legitimate the sacrifices that I (and my partner and my family) have been through over the past year? With this questions running through my head, I kept rewriting. What’s wrong with celebrating an achievement? Why is it so complicated for me to write about it? The answer revealed itself today. And as it often happens, it came out of the blue when I wasn’t looking for it. This morning a lovely friend sent me a picture of a sunrise. And I thought about my love for the dawn. That fleeting moment of transition when the night is not entirely gone and the day is just a promise. I remembered how much I love to stay in the in-between space. How much I love airports and stations. I remembered my fascination when I read about the Bardo, the liminal state between death and rebirth. The answer was there all along, but I couldn’t see it. I don’t enjoy celebrations because they are only about the end. What gives me pleasure is the liminal moment between the end of a journey and the beginning of the next one. That’s why I crave a new beginning. So I can savour the feeling of breathing between the old and the new. And the awareness that those moments are ephemeral makes them even more rewarding. Finally, I found the why for this post. It’s not the celebration of my achievement. It is me sharing the pleasure of being in this liminal space. My journey as a student coming to an end and a new adventure unfolding in front of me. One of the rituals I do every morning is to welcome the new day expressing gratitude. And it is with gratitude that I want to embrace this new adventure before me. I wouldn’t get so far in this journey, as a person and as a coach, without the support of an extraordinary team of people. The fantastic ICA teachers and students from everywhere in the world, the unique energy of the Italian chapter, my gorgeous peer-clients and my precious peer-coaches, my supporting friends, my loving family, my late father and his lifelong example of integrity, Sujith and the extraordinary people of Being At Full Potential. Rossella whose relentless guidance, energy, optimism and trust is a constant inspiration for me. Lorena who believes in me more than I do and inspires me every day to be the best version of myself. Author FabioPosted on August 9, 2018 August 11, 2018 Categories Coaching, Self DevelopmentLeave a comment on This is not the end, this is just the beginning. Can we learn to make better decisions? Maybe it’s because I have quite an experience in making bad decisions. Or perhaps I was just fascinated by the job title; Chief Decision Officer. Whatever the case, among the many articles that crowded my social streams, this onegot my attention. Each day we make countless decisions. Some of them are conscious such as what you want to eat, with whom you want to talk, where do you want for dinner and so on. Most of them are unconscious, or so automatic that it’s hard to call them choices; like braking when you’re approaching a cross. Most of the time, they have no visible consequences, a few times they may be life or death choices. Conscious or unconscious, being able to make choices is a vital function of a human being. Now you can understand my curiosity when I read that Google defined a new discipline to help humans make decisions. To achieve that, Google combined data science with psychology, neuroscience, economics, and managerial science to enable individual humans, groups of humans, and machines to make wise decisions. Though, two questions arise in my head after I finished the article. The goal of the “chief decision officer” is to help people to make better decisions, but what makes one choice better than another? Is it the direct outcome? Or how it makes me feel? Or something else? Take the example of choosing a hotel for a holiday. I may pick a hotel that is entirely bad (for my taste) but in which I meet the love of my life. Would you say that I made the wrong decision? So, If you are asking yourself; “Am I making the right decision?” let me answer by sharing with you this little old Indian story. Once upon the time, there was an old farmer who had worked his crops for many years. One day his horse ran away. Upon hearing the news, his neighbours came to visit. “Such bad luck,” they said sympathetically. The next morning the horse returned, bringing with it three other wild horses. “How wonderful,” the neighbours exclaimed. The following day, his son tried to ride one of the untamed horses, was thrown, and broke his leg. The neighbours again came to offer their sympathy for his misfortune. Before asking yourself how to make better decisions, you should probably find clarity about what better means to you. Better and wiser are subjective terms, while we are talking about an objective decision process. And this distinction leads me to the second point. From the article, it seems that better decisions are the result of an engineered process. Something we can study, model and improve. What would you do if the Decision Intelligence Process tells you to choose something while your guts tell you something different? Who would you listen to? Dave Gray wrote that “Reason does not get people to act. Emotion is what causes people to act”. If we follow a well-engineered process, is there the risk of making a wiser decision on which we won’t act because we are not emotionally attached? I believe that science can highly contribute to our ability to make decisions. But as I see it, the opportunity is not in making better, wiser decisions through a refined process. Instead, it’s more in helping people to rise in awareness. From a higher level of consciousness, they will be able to see possibilities beyond data, to detach from the outcomes, to make choices that align their physical, emotional, spiritual and intellectual layers and, to lean into the unknown allowing the decision to emerge. So, what about a new job title; the Chief Awareness Officer? Author FabioPosted on July 24, 2018 September 3, 2018 Categories Coaching, ConsciousnessLeave a comment on Can we learn to make better decisions? Through the course of our lives, we occasionally experience moments that light up a candle in our hearts. It can be a journey, a retreat, a book, a random encounter, a moment with friends, a walk in nature, a concert, a speech, a workshop or something else. Once that candle is lit, its flame allows us to see the extraordinary beauty that we hold inside. Sometimes we share that moment with others, and the combined light from all the candles gives us an opportunity to see more. More of our beauty and more of others’ beauty. To lit a candle we need at least three elements. First of all, we need the candle, obviously. As human beings, the candle is our potential to shine. A potential that, like a candle, won’t shed any light if we don’t light it up. Then we need a spark to kindle the flame. Sparks are everywhere around us, and they can take any form; people, places, words, images, silence, animals, elements of nature, objects. Anything can become the spark we need in order to light our candle. Then, there is the final element. A vital one that is often overlooked. Like all living beings, a flame needs to breathe. We can’t lit a candle without oxygen. To ignite the flame, we must create the space for the wick to burn. It is amazing what happens when we create and hold a safe space for others. They open up, surrendering to the space, and they kindle the candles within allowing their inner light to radiate. When the space is created and nurtured by a sacred circle of people, the light becomes brighter. And it is in that moment when we allow ourselves to shine that our fears show up. The flame of a candle is feeble. A small breeze can kill it and bring us back to darkness. So, we want to protect it. Protect it from our limiting beliefs, the naysayers, the struggle of our daily lives, the small difficulties we encounter every day. We start worrying that someone may want to blow out our candle, for fear of the greatness they may discover if they lit their own. To protect our burning candle, we hide it inside. Someplace where nobody and nothing can blow it out and take that light from us. Until, without air and space that same flame we want to protect, slowly dies. You may blow out a candle. But you can’t blow out a fire. Once the flames have started then the wind will only blow it, higher and higher. Before a fire nobody can hide, they will all feel the warm power of liberating their inner light. Anytime someone or something light up a candle in our heart, instead of thinking about how to protect it, we should ask ourselves a much more powerful question. How can I use my candle’s flame to start a fire?